Tips for Knee Joint Exercises. Consult your Physical Therapist for a well-rounded exercise program to help maintain healthy knees. Perform your exercises daily for the first month. Knee pain can originate from the hip or foot. Seek advice from your Physical Therapist. Exercise the entire lower extremity when attempting to avoid knee injuries. Your Physical Therapist can assess the way you walk to determine if it may be the cause of your knee pain. Regular knee exercises should play a key role in your conditioning regimen. Over time, the normal stresses and strains of every day life impact the knee, increasing the possibility of injury and long-term damage. By maintaining proper strength, proprioception and flexibility, we can increase the longevity of knee functionality and reduce the likelihood that it will “break down” and require replacement. A Physical Therapist can prescribe an effective knee exercise routine. 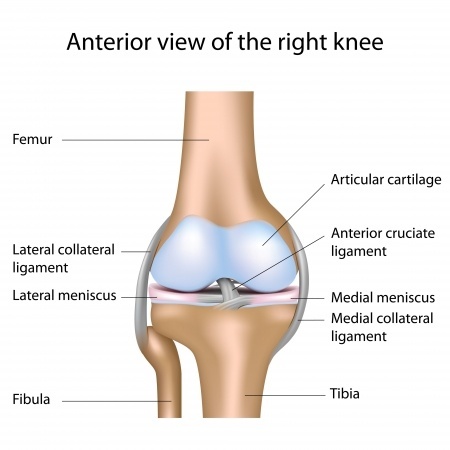 The design of the knee joint makes it particularly vulnerable to injury and damage. It is comprised of three bones (Femur, Patella and Tibia) that function together to allow two basic motions and a little bit of another. Flexion and extension are the primary motions of any “hinge joint,” but the knee has been labeled a “modified” hinge joint that allows a little bit of rotational motion. This motion enables a person to perform certain motions and/or an activity with greater ease due to the slight “twisting” that occurs when the Femur and Tibia move upon themselves. The rotation allows the condyles of the Femur to remain on the Tibial Plateau and “centered on the area of the Plateau that has Hyaline or articular cartilage and not on the rim or fibrocartilage menisci area. Core exercises form the foundation of any knee-conditioning program. If you have read any of the previous blogs, you’ll already know that core exercises are fundamental for strengthening all body parts. The core is the foundation and if it is not conditioned well it cannot offer the support to the rest of the body. Secondly, you will notice that many of the exercises that are performed for the hip are the same exercises that need to be performed for the knee. The two joints are closely related in that motion in one can greatly affect the other. The following exercises will emphasize the importance of including all of the joints of the lower extremity when trying to protect and condition the knee. Some of these exercises are performed unilaterally (one leg at a time), but you should perform the exercise on both legs. Plank: Lie prone (on your stomach) and push yourself up off of the floor. Support your body weight on your forearms, elbows and toes. No other body part should touch the floor during the exercise. If it is too hard to support your body weight this way, you may allow your knees to touch the floor. The position should be held for 5-30 seconds or longer. Side Planks: Lie on one side. Push your body weight up off of the floor and support it with our forearm and elbow on the side that you are lying on. The side of your foot rests on the floor during the exercise routine. If this position is too difficult, keep the entire side of your leg below the knee on the floor during the exercise. Hold the position 5-30 seconds or longer. Ball Hamstring Curls: Lie on your back and place your ankles and heels on the Theraball. Raise your buttocks off of the table and pause. Once you get steady, slowly bend both knees as you begin to roll the ball towards your buttocks. Bring it in as far as you can, pause and then roll back to the beginning position. Try to keep your buttocks off of the ground throughout the entire exercise. Squat: Stand in front of a chair as if you are going to sit down. Your feet should be shoulder width apart. Begin to “sit” down slowly and barely touch your buttocks to the chair seat. Return to an erect/standing position. As you lower yourself downward, your chest and head should be held upward and you should “stick out” your buttocks, don’t allow your kneecaps to move too far forward or beyond your toes. Don’t use your hands to assist the motion in either direction unless it is too difficult to perform. Lunges: Stand with your feet shoulder width apart. Begin the exercise by striding forward with one leg. As the front leg makes contact with the ground begin to slowly lower yourself downward by bending your knees. The front knee should bend to approximately a 90 degree angle. You should stride out far enough that this knee bend can be accomplished without allowing the kneecap to “travel” way beyond the toes of that front foot. The body weight should be shifted to the front leg. The back leg knee flexion is minimal and helps to stabilize the body. Once you have reached the “bottom” of the descent towards the floor, pause and attempt to push yourself forcefully back to the beginning position utilizing the front leg as much as possible to generate the force. You can think that you have stepped on something sharp or hot and you have to get off of it. Lateral lunge: Begin in the same starting position as the lunge. Your initial stride should be at an angle. You can determine the angle that “feels” challenging, but comfortable. A 45-degree angle or stepping on the 2 or 10 o’clock is usually a good angle to start. 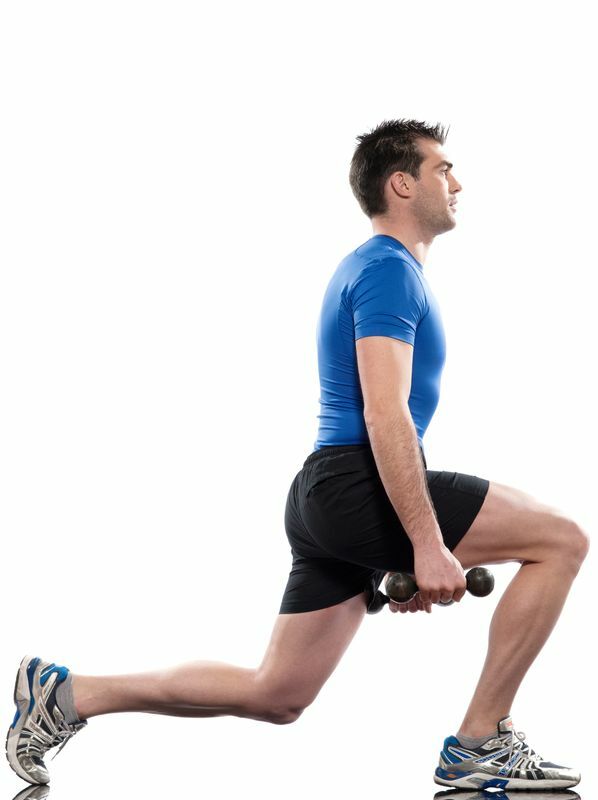 When you stride out the same principles exist with this exercise as in the “regular” lunge. Attempt to flex the front knee to a 90-degree angle, but keep the kneecap behind or even with the toes. If they go beyond the toes slightly that is ok, it occurs during every day life activities all of the time. Hamstring Curl: This exercise has many variations, but the goal is to isolate on the hamstrings (muscles on the back of the thigh). There are many “machines” in the gym that will help to accomplish this goal, but if you are at home you can stand erect with an ankle weight on your ankles. Stand with your knees close together. You might want to support and balance yourself by lightly holding on to the back of a chair. Slow raise one heel towards your buttocks. Keep both knees in a line and next to each other. Bend your knee as far as you can, pause at the top of the motion and then slowly lower your foot back to the ground. You can do this exercise while lying prone on a Theraball. Lie on the ball with your hands on the floor and your torso on the ball. You should have an ankle weight on your ankles and you might have to “hold” a dumbbell between your feet to get more resistance and maximize your efforts. Slowly move both feet towards your buttocks. Being on the Theraball creates an unstable surface and requires the core musculature to work extra hard throughout the exercise. Bend your knees as far as you can without experiencing pain in your knees. At the end point of the motion, pause and then slowly return to the beginning position. Knee Extension: This exercise is performed from a sitting position and can cause excessive pressure in the Patella Femoral joint. If you perform this exercise and have pain in the kneecap area, stop immediately. Place an ankle weight on your ankle and sit with your knee flexed to 90 degrees. Your foot should be off of the floor. Raise your foot and completely straighten your knee so your exercising leg is fully extended. Tighten the thigh muscles (quadriceps) and then slowly lower the weight to the beginning position. Single leg cone touch: Place two “exercise cones” or other objects that are approximately 6-8 inches tall on the floor at the 10 o’clock and 2 o’clock position. Stand on one leg approximately 1 foot behind the cones. Slowly squat down and cross-touch one of the cones with the opposite hand (be sure bend your knee as you squat down). Return to an erect position and then repeat to the other cone. Repeat this routine 10 – 15 repetitions to each cone. Attempt to remain on one leg throughout the exercise routine and then switch legs. If you have difficulty balancing on one leg, you can “toe touch” with the other leg. Quadriceps stretch: Stand erect next to a stationary object. Reach down and grab one ankle and slowly pull your heel towards your tailbone. Be sure to stand upright at all times. Do not bend at the waist and allow your chest to move towards the floor. Hamstring stretch: Place your heel on an object that is approximately 3-6 inches high. Keep your knee straight and lean forward at the waist. Try to put your chest on your kneecap (you will most likely not be able to do so). Do not lean forward and attempt to put your forehead on your kneecap. Inner thigh stretch: Stand erect and spread your legs slightly wider than shoulder width apart. Keep your feet pointing straight ahead and begin to lean to one side. Allow the knee to bend on the side you lean towards and keep the opposite knee straight. You will feel the stretch on your inner thigh of the leg with the straight knee. IT band stretch: Stand erect and place one foot behind the other toe to heel. Begin to bend at the waist and slowly turn towards the side of the front foot. Keep both knees straight. You should feel the most intense stretch in the back leg and on the outside part of the thigh. The knee joint is one of the most susceptible joints to be injured due to the anatomy and the activities that we perform on it. We can attempt to avoid injury via a good exercise routine. Your Physical Therapist can prescribe an appropriate exercise routine that will help you maintain a healthy set of knees.